In late 1979 it was decided to form a Branch of the O.N.E. which would have close links with the Air Corps and have Baldonnel as its base. In this way, the Branch through the ONE organisation would provide help and assistance where necessary to the camp personnel at the time of their discharge. With the kind permission of the GOC Air Corps, the Branch was named “The Roger Casement Branch” and was permitted to hold their meetings in Baldonnel. From that meagre beginning, the Branch has grown from strength and is held in high regard within the O.N.E. organisation. The success of the Branch stems primarily from the support and activities of the members and the help and co-operation from GOC Air Corps and the personnel in Casement Aerodrome. Apart from keeping to the mission of maintaining contact with former colleagues, a number of significant events have been undertaken by the Roger Casement Branch including the following; The creation of the O.N.E. 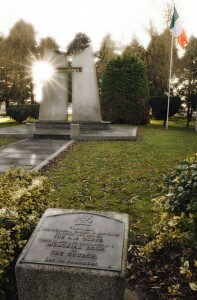 Memorial Garden in Baldonnel with the unique Monument to the memory of the deceased former personnel who have served with the Air Corps. An Annual Mass of Commemoration which is held in October each year in the Garrison Church in Casement Aerodrome. A Memorial Book containing the inscribed names of the deceased personnel is located in a special cabinet in the church. The presentation of a unit flag designed by a member of the Branch to the Apprentice Training School. A presentation to the GOC Air Corps of a book of copies of the letters of Roger Casement. The GOC Air Corps allocated an office in the Museum area for use by the Branch. 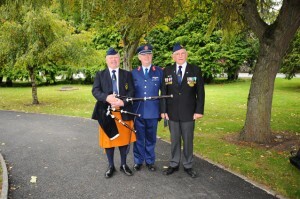 Each year a number of trips to places of historical interest are arranged as well as events which provide an opportunity for former colleagues to meet and renew acquaintances, for example, the annual lunch at Christmas creates an opportunity for retired personnel who have previously served in the Air Corps to socialise and renew acquaintances with each other. This is a very popular event and has become a favourite reunion of former colleagues. The high-light of the year is the Annual Memorial Mass which is held in the station Church in Baldonnel on the second Sunday of October at 1000 hrs. Deceased former Air Corps members are remembered at the Mass and a wreath is laid at the adjoining memorial monument. The church is normally filled to capacity with former Air Corps personnel and with families of deceased members. Personnel who have served in any part of the Defence Forces are very welcome to join the Roger Casement Branch and to attend the Branch Meeting which is held on the third Thursday of each month at 20.00hours in the NCO’s Mess, Baldonnel.